Imagine a world where trains run continuously, picking up passengers without ever having to waste time stopping and starting at individual stations. That’s the vision behind a revolutionary concept created by Chinese designer Chen Jianjun. Rather than waiting on a platform and filing through the train’s series of narrow doors, passengers wait in a pod above the tracks. As the train passes through the station, the pod locks onto the roof of the train and the passengers descend down a staircase into the train below. HOW DOES THE TRAIN WORK? Passengers wait in a pod on an elevated platform at each station. As the train passes through the station, this pod locks onto the front of the roof and passengers descend onto the train. The pod then moves to the rear of the roof to pick up passengers who want to exit at the next stop. 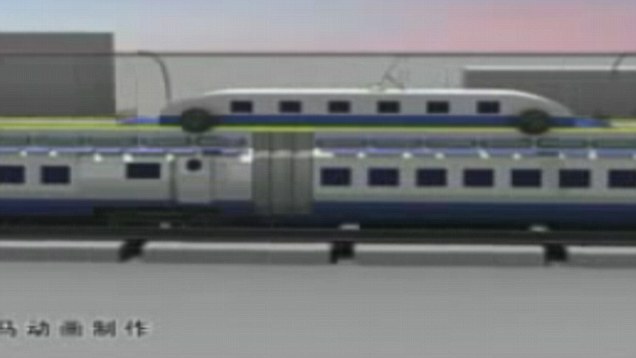 When the train arrives at the next stop, the rear pod is detached and a new pod is collected. The cabin then moves to the back of the train where people who want to exit at the next stop ascend into the roof-top pod. As the train approaches the next station, the pod detaches and comes to a stop at the station, as the next pod is collected. The video is in Chinese, but according to a translated version, the designer explains that on a journey between Beijing and Guangzhou there can be up to 30 stops. If each stop takes approximately five minutes to drop off and pick up passengers, this adds an extra 2 hours and 30 minutes to the journey. The video also explains that the concept would save energy and fuel without having to stop and start each time. Since the concept video emerged, a number of other designers have also suggested that instead of a staircase, passengers could slide down a chute onto a cushion in order to save even more time. The concept does not explain how disabled people, or people who are unable to use stairs, would use the system, for example, and there are also no plans to make this concept a reality yet.